I like free software and I like "Surfing the Net". So this month let's combine these two "likes" with review of a program called FreeSpeech Browser. FreeSpeech Browser is a voice recognition program available at http://www.speech.philips.com/fsbrowser/hfsbrowser_main.htm. As it's developer puts it "FreeSpeech Browser is the easiest way to access the Internet using the power of your voice. Just say where you want to go, and FreeSpeech Browser does the rest!" That developer is Philips (http://www.philips.com/home.html). SCPCUG members should remember Philips. Their rep gave us a demo of Philips FreeSpeech 98 at our monthly meeting on Oct 26, 1998. Philips is now marketing FreeSpeech 2000 (http://www.speech.philips.com/ud/get/Pages/072fr.htm) which is a commercial full blown voice recognition program for Continuous Voice Dictation and Command & Control (i.e. navigation) of your Windows Environment including surfing the Internet. As a way of perhaps getting you interested in buying FreeSpeech 2000, Philips is offering the FreeSpeech Browser absolutely free. Unlike other free programs, this one comes with no ads or nag screens. This 10 MB download is a quality product. However, the program is somewhat limited by design because if they gave away everything you would have no incentive to buy FreeSpeech 2000. So what are the requirements you ask? Well first off, it only works with Microsoft Internet Explorer (IE) versions 4.01 (with the latest Service pack) and 5.0. Netscape Navigator Browser users are out of luck. You will also need at least a Pentium 166 MHz with MMX and 48 MB of RAM. The program does not modify your Internet Explorer at all. It integrates with IE as an overlay giving you the additional voice recognition capability and appears on your desktop as a moveable toolbar. Clicking on the "dude on a surfboard" icon of the FreeSpeech Browser automatically brings up IE. But when FreeSpeech Browser is not activated and the IE icon is clicked on, IE alone comes up. IE will appear and work just as it always has. I mentioned earlier that the program was limited by design. This design limits you to IE Browser web page surfing. There is no voice dictation capability into e-mail, chat windows, word processors, etc. You can navigate from one web page to another by calling out links within those web pages. You can move back and forward between web pages by saying "Click Back" or "Click Forward" respectively. You can reload web pages by saying "Click Refresh" and stop them from loading by saying "Click Stop". What you can't do is say voice commands for opening IE Browser menu items such as "File" or "Favorites". Although this may seem somewhat limiting one can easily learn to combine the voice recognition part with mouse movement. Actually, even when using a full blown voice recognition program, combining voice with mouse movements is often the fastest way to work as some operations are just naturally done faster with a mouse. As mentioned earlier you can't just say the name of a web page you want to go to in your Favorites list. You have to go to some page first and then from that page you can say the links within that page. That is the heart of this free program. Other companies actually have separated the web surfing part of voice recognition out from their standard voice recognition products and sell the web surfing as a separate product. Philips handles the link recognition on a web page in two different ways. In preferences you can set the program up to number all links on a page or only those links it cannot voice recognize. Acronyms like "scpcug" are not voice recognized because they are not pronounced as words. I actually prefer to have all links associated with a number. Many web pages have so many links that it is easy to miss some. By having a little number overlay next to each link you won't miss any. Philips has even provided for the case where the little number covers some of the wording making it unreadable. One has available the voice commands "Show Link Numbers" and "Hide Link Numbers". So why these numbers? 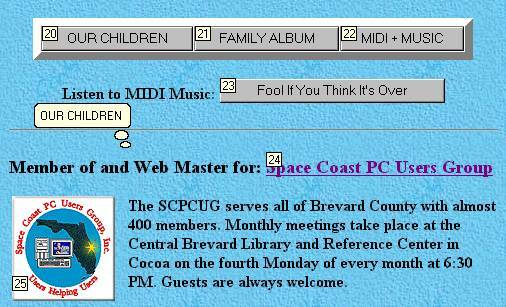 So you can use a simple voice command like "Number 24" instead of saying "Space Coast PC Users Group" on my personal web site home page (http://www5.palmnet.net/~cpotsic). The program recognizes links other than just underlined links. It will recognize a graphic that has been made into a link such as the SCPCUG button gif on my home page. There is no way to know exactly what to say as a name when the link is a graphic, so here again saying the number ("Number 25" for the SCPCUG button gif) solves the problem. The FreeSpeech Browser will also recognize Java buttons that are links such as the "Our Children" ("Number 20") and "Family Album" ("Number 21") buttons on my home page. In this case one has the option of either saying the number or the name on the button as both are recognized. If in this case one did say "Our Children" the link would enlarge slightly and blink briefly followed by a cartoon type speech bubble to confirm that the voice was properly recognized. I did find that the FreeSpeech Browser did not recognize the links in the News Scroller on our SCPCUG Home Page (http://www.scpcug.com). The News Scroller is a Java Applet and as such may have some unique coding that is not recognized. Another limitation is that if one activates by voice a link that launches another application like RealPlayer 7 or Adobe Acrobat Reader you are then left to navigate and close those windows using your mouse or keyboard commands. The FreeSpeech Browser only allows for opening, closing, restoring, or minimizing the IE Browser window. Movement within a web page is also somewhat restricted. The only voice commands available are "Page down", "Page up", "Move to top", and "Move to bottom". Full blown voice recognition programs additionally allow for moving or scrolling down or up any number of lines within a page and saying things like "Page up 3" to move up three pages at once instead of saying "Page up" three times. At any time during your surfing you can call up the Basic Voice Commands window by simply saying "What can I say". Thus, you are never left wondering what to say. Since the program is free, Philips does not provide much in the way of Tech Support. There is only a "Tips and Tricks" page on the web (http://www.speech.philips.com/fsbrowser/fsb_tips.htm) but it really does not tell you much. The program does include a very comprehensive Help File so I doubt there would be a need for Tech Support. Installation is quick and easy. The first time the program is run it walks you through the audio setup to adjust your volume settings for microphone and speakers. Training is a matter of reading 10 sentences which takes less than 5 minutes. You are then ready to surf. Voice recognition is excellent. You would expect it to be with a very limited universe of commands but don't be fooled. This program also recognizes link names and we all know links could be named just about anything. The full blown FreeSpeech 2000 comes with a Background Lexicon of 300,000 words. I don't know how much of that may be in this program but its recognition capability certainly impressed me. If you like what FreeSpeech Browser has to offer but want a bit more capability for surfing the Net, then you might want to try Conversa Web 3.0 at http://www.conversa.com/. You can download a trial version at http://www.conversations.com/downloads/conversaweb. This commercial program (which again only works with the newer versions of Internet Explorer) also uses the Philips voice recognition engine as its basic underlying structure. Conversa adds music (midi files) while you are waiting for sites to load and some Text to Speech capability in that it will read you a list of links. The Text to Speech does not allow you to copy text to the Clipboard and then have it read back to you. Conversa has a number of Voice Activated Sites (http://www.conversations.com/) for things like Stock Quotes, Weather Information, Playing Games (like Blackjack, Tic-Tac-Toe, Trivia for Trekkies), Area Code Lookup, etc. These voice activated sites actually talk back to you as if you were holding a conversation, hence the name "Conversa Web". Read more about these voice activated sites on the Conversations.com FAQ page, http://www.conversations.com/faq.htm. Conversa Web is not limited to just the special voice activated sites but those are the only ones that will talk back to you. Upon surfing the SCPCUG website I found the program quite accurate in allowing me to call out by voice the many link names both in the menu and embedded within the text and graphics of the pages. Conversa provides more feedback than the FreeSpeech Browser in that it confirms your voice commands with a male or female voice (wav file) saying it is performing your requested operation. Conversa Web 3.0 was a CNET Editors' choice in a Sept 15, 1999 review by Gregg Keizer. Read the review at http://home.cnet.com/software/0-3731-7-117646.html.